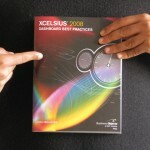 Use Xcelsius 2008 to get better answers, identify emerging trends and opportunities, and manage more effectively. Learn hands-on, through step-by-step examples using real business data. Discover tips and tricks proven in real-world environments. Fully leverage the information in your Excel spreadsheets–and go beyond Excel to use XML source data, too. Implement Xcelsius best practices drawn from the hard-won knowledge of the entire global user community. Deliver dashboard content in whatever format works best: as HTML pages, PowerPoint presentations, PDF files, or Word documents. ← How to create an Analog Clock using Xcelsius?